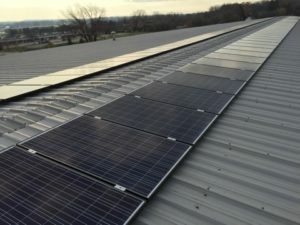 In November 2015, SunPeak installed and commissioned our new rooftop solar systems on the Darwin Road warehouses. The average grid-supplied energy use in our commercial and household goods storage buildings have dropped by about 50%, reducing our Green House Gas emissions by roughly 2.5 tons per month. We are happy to report that both warehouses have had several months of net energy production over the course of the summer! A big thanks to SunPeak, Focus on Energy and MG&E for helping us continue on the path to a greener future. Project photos and details are available on SunPeak’s website.